Call 954.300.2520 for a FREE Confidential Consultation. Attorney: Elaine M. Gatsos, Esq. Deerfield Beach Foreclosure Defense Attorney: Elaine M. Gatsos, Esq. The Law Office of Elaine M. Gatsos, is headquarter in Boca Raton, represents clients in foreclosure defense cases, and is the firm’s lead negotiator for pre-foreclosure loan modification and short sale cases throughout south Florida. Nova Southeastern Law School 1980 J.D. Deerfield Beach Foreclosure Defense for Florida homeowners that have been hit hard by the real estate bust. Those of you who are in foreclosure or close to it, we will show you how and why to fight your foreclosure, and then discuss foreclosure defense strategies as your first line of defense in the fight to save your home. 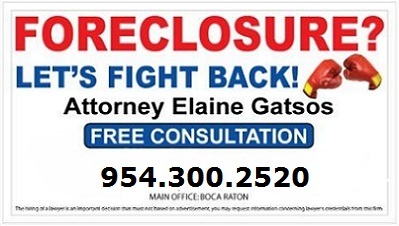 It's time to take action with foreclosure defense attorney Elaine M. Gatsos, Esq.! As defined by Wikipedia, Foreclosure is the legal process by which a mortgagee, or other lien holder, usually a lender, obtains a termination of a mortgagor's equitable right of redemption, either by court order or by operation of law. Usually a lender obtains a security interest from a borrower who mortgages or pledges an asset like a house to secure the loan. If the borrower defaults and the lender tries to repossess the property, courts of equity can grant the borrower the equitable right of redemption if the borrower repays the debt. While this equitable right exists, it is a cloud on title and the lender cannot be sure that it can successfully repossess the property. Therefore, through the process of foreclosure, the lender seeks to foreclose the equitable right of redemption and take both legal and equitable title to the property in fee simple. Other lien holders can also foreclose the owner's right of redemption for other debts, such as for overdue taxes, unpaid contractors' bills or overdue homeowners' association dues or assessments. How to STOP Foreclosure in Florida! Source: The Florida Attorney General; Contact your lender or loan servicer as soon as you realize you may have a problem and may have missed a payment. Studies show that at least 50 percent of all consumers that have defaulted on a mortgage or missed payments never contact their lender. This is a mistake. Lenders can discuss options with you to help you work through payments during difficult financial times. Lenders prefer to have you keep your home and most will work with you. Be honest with your lender about your financial circumstances. We will ensure that you are fully understand the foreclosure process in Florida. The Law Office of Elaine M. Gatsos can help stop your foreclosure if you are behind on your mortgage payments and or facing a default lawsuit. Foreclosure in Florida requires you to respond within 20 days after receiving a foreclosure default from your mortgage company. Get Coral Springs home mortgage foreclosure help by calling 954.300.2520. We handle Foreclosure Defense cases throughout south Florida; Fort Lauderdale, Boca Raton, Delray Beach, Boynton Beach, Palm Beach, West Palm Beach, Wellington, Palm Beach Gardens, Coral Springs, Deerfield Beach, Parkland, Coconut Creek, Pompano Beach, Lighthouse Point, Sunrise, Hollywood, Wilton Manors, Lauderdale by the Sea, Davie, Plantation, Miramar, Pembroke Pines, Southwest Ranches, Weston, Miami, Miami Beach, South Beach, North Miami Beach, Bal Harbour, Sunny Isles, and Aventura. Are you behind on your home mortgage payments? Is your mortgage as much or higher than the value of your house? Are you a victim of the economy and/or the collapse of the real estate market? 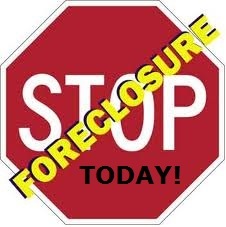 Has the foreclosure process already started or are you waiting for it to start shortly? Are you currently trying to get your mortgage company to work with you on a repayment solution? Do different people give you different information every time you call the mortgage company? Are you a victim of predatory lending practices by a bank or mortgage company? Have you ever been served with foreclosure papers from a Florida Circuit Court?